If you are a small business, adopting both inbound and outbound strategies as part of your marketing mix can be an extremely effective way of growing your business. Whether you need one more than the other, or equal amounts of time invested in both, will be determined by your value proposition. That is, the product or service you sell, the sectors in which you are active, the types of decision makers you are trying to engage with and any other contributing factors. There is no right or wrong, and the only way to really know what works best for your business, is to test, test and test again. However, before setting out on your B2B marketing journey, let’s take it back a step or two and recap on the differences between inbound and outbound. Inbound Marketing. Broadly speaking, we are talking about digital marketing and a content driven methodology which provides relevant material to your target audience, whether that’s blog posts, videos, infographics, links or webinars. By providing useful information and suggesting solutions to problems your audience may be facing, you can engage further and drive business. Inbound is about adding value to someone’s day. If you can help them, enlighten them, inspire them or improve their experience, you stand a good chance of engaging with them. Inbound strategies have been used by larger companies since day dot com. A good example is HubSpot, who very successfully use it to drive sign ups to their marketing automation software. Outbound marketing. An approach that allows you to engage with your audience on a one to one level, by email, telemarketing, direct mail, and now social media channels such as LinkedIn. By striking up a direct line of communication with people or companies that are a part of your target audience, you can find out their unique situation and provide a solution. Social media and web sites enable you to research your prospects before approaching them. There is no need any more to be ‘cold calling’ in its literal sense. A little research before making your move can go a long way. Outbound has been used by both big and small companies over the years and has been the driving force behind 20th and 21st century marketing. The key difference that catches many of our clients by surprise is the speed of engagement and sale, particularly if they have grown their business organically (via inbound) and are deciding to ‘try outbound’ for the first time. It’s fairly obvious when you think about it: if someone comes to you with an enquiry or a brief because they have found you online, chances are they already know what they want – you just have to sell it to them. If you or your business development agency approaches someone directly for the first time (outbound) and they agree to a conversation or meeting, it’s likely to take longer to convert them into a customer. They’ll need time to get to know you, you’ll have to earn their trust, you’ll have to build up the relationship. Business decisions are not made as readily as they once were, so in most cases in outbound marketing, you need to have a pipeline-building mentality. If you’re investing in an agency to help you, you need to be thinking long(ish) term. The average sales journey (i.e. from blank canvas to revenue conversion) in our experience is about 6 months. For anyone involved in inbound marketing, this is still a common phrase. However, companies are having to become more and more niche due to increasing competition around every corner. Larger companies have monopolised the online space with pages and pages of content. This is leaving SME’s to fight over long tail keywords to claim their niche, only to find most people aren’t typing in the correct search engine queries for them to be found. Broader key words and phrases are saturated in search engine results, mostly by these big companies with content creation departments. 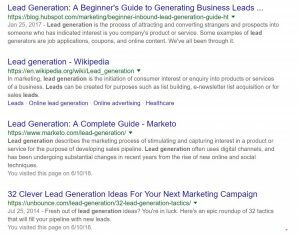 When Googling the phrase “Lead Generation”, for example, the first thing you come across is a saturated ad space featuring the likes of LinkedIn who are there because they are big enough to afford the ad space and are relevant. This is followed by top organic results from companies such as HubSpot, Wikipedia, Marketo and Unbounce. HubSpot, Marketo and Unbounce are all very lucrative marketing automation software providers, who all use inbound marketing strategies. There are benefits to inbound marketing though, that make it worth the effort. Being found online continues to be extremely important for businesses, whether through your website, social media profiles or case study portfolios. Creating content and promoting it is the bricks and mortar for any business that wants to be found online. A company’s online presence has now become a business validation tool for perspective customers in both B2B and B2C industries. Ask yourself, are you more lightly to buy a product or service from a company with a strong online presence or from one with a weak online presence? This being said, maintaining a strong online presence does not mean you are committing yourself to lead generation solely through inbound marketing. In an inbound campaign, you are using tailored content to fit every stage of your customers journey, from attracting, converting, closing and delighting. This content paired with a network of landing pages and CTA’s (calls to action) moves your prospective customers through the marketing funnel. Traditionally, small B2B enterprises have colonised the outbound marketing world through mediums like direct mail, cold calling and networking events. According to many surveys in 2017, email marketing was the most popular way of engaging and generating leads, in spite of business owners receiving 10s, if not 100s of emails a day. However, to do it well and generated results, you need a solid strategy. Unsolicited phone calls and emails can be easily ignored and now with GDPR in place, marketers need to be continually asking themselves the question around compliance. This year, whether you’re involved in inbound marketing, outbound marketing, or both, it’s all about being ‘disruptive’. Shouting about your product or service and not considering the unique position of members of your target audience, is a sure way to get your value proposition ignored. By building relationships with your audience and providing value, pointing them in the direction of a piece of content that they can relate to and benefit from, or asking them about their pain points and explaining how you can solve them, is a good way to disrupt their business behaviours. People know what outcome they want, they just need to know how they can get there. So be brave with content. Don’t be afraid to challenge the status quo or ruffle a few feathers – you’ve got to find a way of getting heard above the noise. So. Are you in an ‘inny’ or an ‘outy’? As an outbound business development agency you might expect us to focus all your efforts on outbound. However, experience tells us that a healthy mix of both can usually achieve the best results. After all, if you engage someone on the phone for the first time (outbound) the first thing they are likely to do is check out your web site and digital footprint. If this doesn’t align with the way you present your offering verbally, then there may be a mismatch followed by a swift ‘dis-engagement’.